In a previous article we described the way to rotate a video with VLC Media player. But in the last days, some of our readers have complained that the final rotated video is doubled and the video quality is pure. So I decided to look further into this problem in order to help them. Unfortunately, I discovered that by using the latest version of VLC Media Player (Ver 2.1.2) to rotate a video (using the procedure described in my previous article), the final rotated video result is problematic (the video is doubled and in a bad quality). Step 1: Download and install VLC Media Player. Step 2: Rotate your Video to the angle you like. 1. Now open the video that you want to rotate with VLC Media Player. 2. In the VLC Media Player main menu, go “Tools” > “Effects and Filters”. 3. In “Adjustments and Effects” window, choose the “Video Effects” tab. 4. In “Video Effects” tab, choose “Geometry”. a. Click the “Rotate” box to enable rotation. b. Then move the rotator (drag with your mouse) to the left (or right) until you specify the angle that you want to rotate your video. c. Press ”Close” to exit “Adjustments and Effects” settings. Example: To rotate a video by 90 degrees Right: move the rotator to the Right at 90 degrees angle. Now you can view and play your rotated video with VLC Media player (only) in the specified angle. If you would like to save your recent rotated video, then continue to the next step. Step 3. Save a rotated video to the right angle. 1. From the VLC Media Player main menu, go to "Media" > "Convert / Save". 2. At "Convert/Save" options at "File" tab, choose "Add…" to add the video that you want to rotate. 3. At the “Select file(s)” window, find and select the video(s) that you want to rotate (e.g. “MOV_01” in this example) and press “Open”. 4. Then press the drop-down arrow found on the right of "Convert / Save" button & choose "Convert". 5. Now press the "Tools" button found at the right of “Video – H.264 + MP3 (MP4)” profile. 6. In Profile options, choose the “Video Codec” tab. 7. At “Video codec” options, choose “Filters”. Scroll down until you find the “Rotate video filter” and select the checkbox beside it. Press the “Audio codec” tab. At Encoding parameters you can choose the audio codec to be used for the video conversion (e.g. “MP3”) and/or you can specify a better quality for the final rotated video audio (e.g. “256 kb/s). At the above example we have specify the “MP3” for audio codec and we set the bitrate to “256 kb/s”. 9b. Choose the destination folder (e.g. your "Desktop") & then type a file name for the converted file (e.g. "MOV_01_Rotated”). Press the “Save” button when finish. 10. Finally press "Start" to start the conversion. * As "Conversion/Streaming" process is executed, you see the following screen. 12a. From the main menu go to "Tools" > "Preferences". 12b. Press the "Reset Preferences" button at the bottom side of Preferences window. 12c. Finally close and then re-open again the VLC Media player program for the changes to take effect. Now you can navigate to the destination where your have specified to save the converted/rotated video (e.g. "MOV_01_Rotated”) and from now on you can play it in any media you like at your desired angle. 1 I downloaded the FFMPEG package. out.mp4 is the rotated video. I am using VLC 2.2.4 with Windows 8.1 and this method worked for me. Great article, but. . . the method doesn't work for me. I tried rotating a short *.MPG file by 90 degrees using both the 90 degree transform option and (later) the rotate option, set to 90 degrees. Both methods gave me a file that was roated by possibly 30 or 45 degrees – very bizarre! I assume this is yet another example of VLC's inherent flakiness – it quite often just doesn't work right, and an operation can work fine one attempt, then fail for the next few. I'm on verion 2.2.8, on 64-bit Win10. I'll keep testing and see if there's something else I need to do. Hi,I have tried to rotate my video but I don't find filters option after video codec. Tq guys….It helps a lot…. @John Smith: The answer is on instructions: RESET PREFERENCES > (Step 12…). That's very cool. I did it. 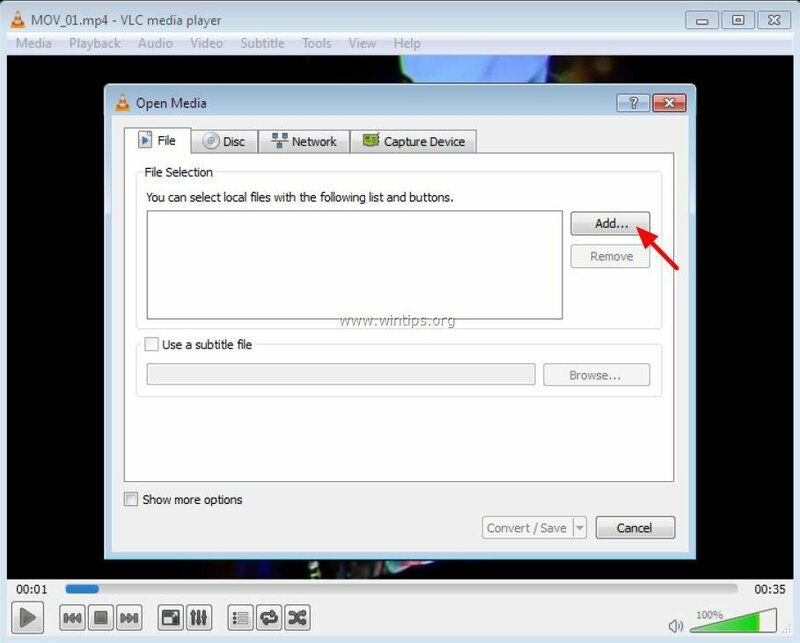 VLC 2.2.2 this method does not retain audio track. Thank you for the clear explenation to do this in VLC, I tried it in version 2.2.4, but did not have the desired result. Will try with the 3.0.0 version later. Then I tried with Movie Maker that appears to be a tool on my Windows 10 PC(don't know if this is a default tool or came with MsOffice). Just opened the original 3gp video from my Android Phone that is 270 degrees rotated and clicked in the 'Start tab the button for 'rotate left 90 degrees' and hit File – Save movie. The only option is .mp4. The video is still 1920×1080(no shop off). The origianl video was 219Mb and the rotated mp4 is 308Mb. The quality looks good. When rotating video 90 degrees, you need to use the transform option not rotate because you need to rotate the frame also and not end up with chopped off edges. 14. Click on the "Video codec" tab, then click on the "Filters" tab. 15. Scroll down the list to find "Video transformation filter". you need to tick the transform, NOT the rotate option like they say everywhere else. Also you can check the "keep original audio track" instead of converting it to mp3. a very accurate & helpful article. All you have to do for perfect, glitch free zooming is check the "transform" option above. This creates exact 90 degree zooming without cutting off. Here's a simpler way, someone created a mod for FFMPEG. Change the text in the batch file to match your files. Also, rename your input files so they don't have spaces. This will keep the original audio, rotate the video 90 degrees clockwise, convert the left eye to 720p @60/30fps, and un-warp the video. I figured out WHAT works and what doesn't. In fact, in the current version 2.1.5 and previous version 2.1.3, there is NO RELIABLE WAY to get a rotation other than 180°. So, if you want to rotate 90° clockwise or counterclockwise, it just won't give the expected result. Either VLC crashes or you get double images side-by-side or it shows OK in VLC but not in other players or on television screen. 180° rotation (or horizontal or vertical transposition/flip) works fine. The GOOD news is that a solution is on the way! I produced quite some text to read here but once you read that you will find that the reading took longer than the actuel solution. I have tested a development version of VLC and it works great! As VLC states, there is NO GUARANTEE whatsoever on the behavior of this version 3.0.0 which is still under development. You use it at your own risk. I am not an expert and certainly did not test ALL functions of VLC but I did play quite some videos and tried at least ALL transform options available for conversion and all work flawlessly. You might experience other behavior, perhaps also depending on your operating system or types of videos. As to my videos, they come from my HTC One S smartphone. They are full HD (1920 x 1080). Their length is only a couple of minutes in general, so I can't tell yet how this new VLC performs with longer videos. With this version, every kind of rotation works fine and I even found an easier method to use it. I noticed that with my videos 180° or flip rotations in VLC produce an output file that has roughly the same size as the input file. But as soon as I try another angle, say 90° or 270°, the output file size loses roughly one third of the original. This may have to do with a non square pixel shape, I have no idea. Apparently, 90° or 270° rotations are more complicated than 180° rotation and perhaps even use a quite different algorithm. My guess was that if the file size is one third smaller, than there is either a better compression or I lose some quality. Since I just want to rotate and stick as close as possible to the original video quality, I wanted to keep the output file as similar as possible to the input one. I found out that the files that VLC shrinked down had a lower bitrate than the original ones. That is where Mediainfo comes in. Mediainfo is a small utility which, once installed, adds itself to the right-click menue in the Windows Explorer. In Windows Explorer, right-click on the video you like to rotate and select Mediainfo. A pop up window will appear giving details about Video and Audio codecs used, resolution of the image and more. Look for the Bit rate specified in the video section. VLC might be able to show that information as well but I couldn't find it (it does not appear in Ctrl/J). You will need this Bitrate info for a lossless conversion. That said, if you don't set a specific bitrate and let VLC handle your video, thus resulting in a file which is roughly one third smaller, the result is still good. I only spotted some minor artefacts in the "VLC automatic" output videos compared to the "bitrate optimized" ones. 1. Download, install and launch this 3.0.0 development version of VLC. 2. Go to "Tools", "Preferences" and – at the bottom of that window – click "All". 3. Scroll down to the "Filters" section underneath the "Video" section. 4. Click on the white triangle in front of "Filters" to open the list. 5. Click on "Transformation" (the last filter in this list). 6. In the right pane, chose the wanted transform type, they ALL work flawlessly ! but also flip the image horizontally. 7. Click "Save" in the lower right corner. You now have permanently established transformation settings for all future video conversion jobs in which you include this filter. You can of course change this setting to another option at any moment. As long as you don't explicitly include this filter in a conversion job, you can just leave it set as it is, it just won't be used. This setting is not used either for video playback. If you play your original video which has the wrong rotation, it will still show up wrong. You can still use the functionalities activated by checking the "Transform" or "Rotate" check boxes in "Tools", "Effects and Filters", "Video Effects" tab, "Geometry" tab to properly play your video without definitely transforming it. These functionalities just allow you to properly play your video within VLC. VLC remembers your playback preferences for every video, so you don't have to set these settings the next time you play the same video again. But these settings do not influence the way the video is played in other players like Windows Media Player, nor do they influence the permanent conversion. 8. Do Ctrl/R or click "Media", "Convert / Save…" in the VLC main menue. 9. Click on the "Add…" button at the right and navigate to the folder containing the video you want to convert. 11. Click on "Convert / Save" at the bottom of the window. 12. Click on the "Tools" symbol at the right of "Video H.264 + MP3 (MP4)". 13. Click on the "Audio codec" tab.To keep the original audio track, just hit the appropriate checkbox. 15. Scroll down the list to find "Video transformation filter". Check the box in front of it. 16. If you are not interested in keeping the video file size and supposedly the exact quality, skip the next step. 17. Click on "Encoding parameters" tab. At "Bitrate", select and delete the text "Not used": The unit "kb/s" will appear. Type in the bitrate you found in Mediainfo in front of "kb/s". quality should be as close as possible to the original video. In my case, this bitrate varies from video to video. but it was always around 9700 kb/s. 18. Click "Save" in the lower right corner. Now your conversion parameters are set. They will stay permanently until you change them or Reset all your préférences. From now on, for subsequent conversions using the same settings, you just need to specify the source file and destination. folder and type in the output file name. Click "Save". an output file name different then the input one, for instance "VIDEO0072rotated.MP4". You can also put in the path and file name right here at "Destination file:" without going through the "Browse"
window (you must skip the "file:///" prefix). 21. DONE. Click the "Start" Button to have VLC do the job. want to replace it but will NOT start your conversion! That's it! Thank you for reading all along until here. It is worth while to give it a try! VLC 3.0.0 would not work on my XP machine, but your instructions worked exactly as you described with v 2.2.1, except that the bitrate was not preserved, even though I entered it as you described. Still, I got a properly-oriented movie, uncropped, and of comparable quality to the original. I especially appreciated your observation that the conversion would not occur if the target file exists. I would have given up at that point. Thanks! i'm sure on youtbe it would be the same problem. cause there is already a video about the same issue. My image was cropped too with it leaving a square video. If you click the "transform" button and select rotate 90 degrees it will easily rotate the whole image. Everything else is the same. Thanks for the tutorial. Thanks for the tutorial. However, I have another question. I would like to keep the same configurations of the video (e.g. keep it as a avi. video). Is it possible? I need to use the video in another software, but after rotaring the video, my softerware did not recognize it. I haven't tried that. But you can give it a try and share the results. Thank you very much for your tutorial but I have the same problem than Amos : the video is cropped at top and bottom (2.1.3). Note that in 2.1.3, to create a mirror image, it is necessary to select the "Transform" filter. Thank you indeed for the article, it just come in time for me to solve the problem when rotating video using ver 2.1.2. It works almost perfectly, except the converted video is now 'smaller' with the top and bottom view no more visible – the image is reduced now! Any way of solving this matter. Thanks again for the great job that you have been doing so far. Much appreciated!